The Light crude oil traded between a resistance cluster formed by the combination of the monthly and weekly pivot points at 64.69 and a support level set by the weekly S1 at 63.06 during last week's trading session. Technical indicators flash bullish signals on both the smaller and the larger time frames chart. Therefore, it is likely that the Light crude oil prices will continue to appreciate against the US Dollar during the following trading sessions. Bullish traders could push the commodity towards the $66 mark in the short-term future. 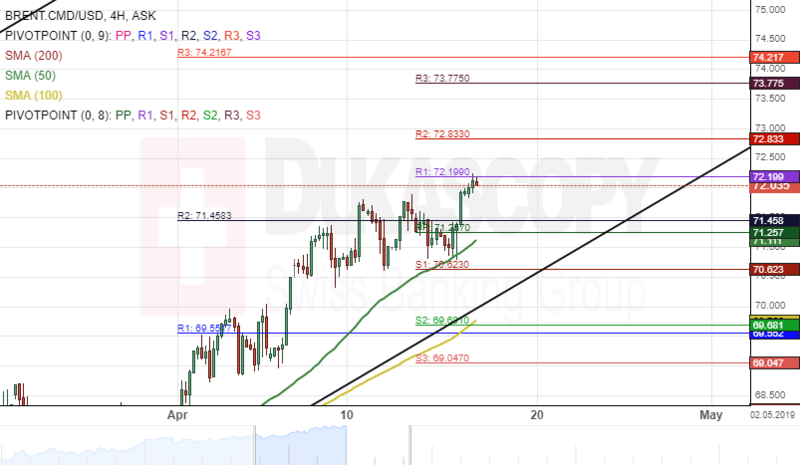 However, bulls are currently facing a resistance cluster at 64.71 and need to surpass that level before aiming higher. The 50-hour simple moving average guided the Brent crude oil during last week's trading session. The commodity reached the $72 mark during Tuesday's trading session. Everything being equal, it is likely that the Brent crude oil prices will continue to gain strength against the US Dollar. The potential upside targets for the pair will be at the $74.00. However, a resistance level formed by the weekly R1 at 72.19 could provide resistance to the BRENT.CMD/USD pair during the following trading sessions.